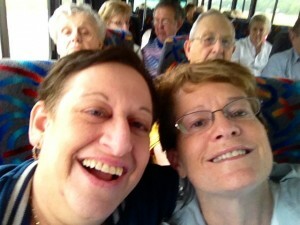 Congregation Or Ami participates each month in the Harris County Senior Trip program. The congregation serves as the sponsoring group, and the county provides a bus and driver at no cost. This program is designed to ensure that seniors keep active while exploring and enjoying Texas. Anyone 50 or older is eligible to attend. Tours must remain in the state and must return to home base each trip day. Popular destinations this year have included San Marcos, home of the Wimberley Glass Works, and the town of Orange, home of the Stark Museum of Art. We have ventured to Lake Jackson to see the Fish Hatchery and to Brenham for a tour of the Blue Bell Creamery. In Galveston, we went on a Harbor Tour & Dolphin Watch. 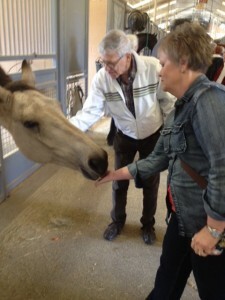 And we have also stayed closer to home and visited sites in Houston including the Houston Police Mounted Patrol stable. No matter where we go, lunch is always in the plans! For upcoming event dates, please go to our Events Calendar and look for Or Ami/Harris County Senior Trip information. The journeys usually leave Or Ami at 9 a.m. For more information, please contact our office via email or call 713-334-4300.